When a control is disabled, i.e. its IsEnabled property is set to false, the user cannot give the control keyboard focus by clicking on it. The control also cannot gain focus by use of the tab key. 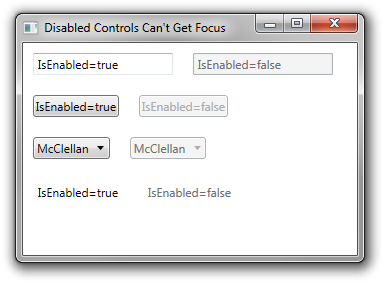 Disabled controls cannot get focus, even if both their Focusable and IsTabStop properties are set to true.